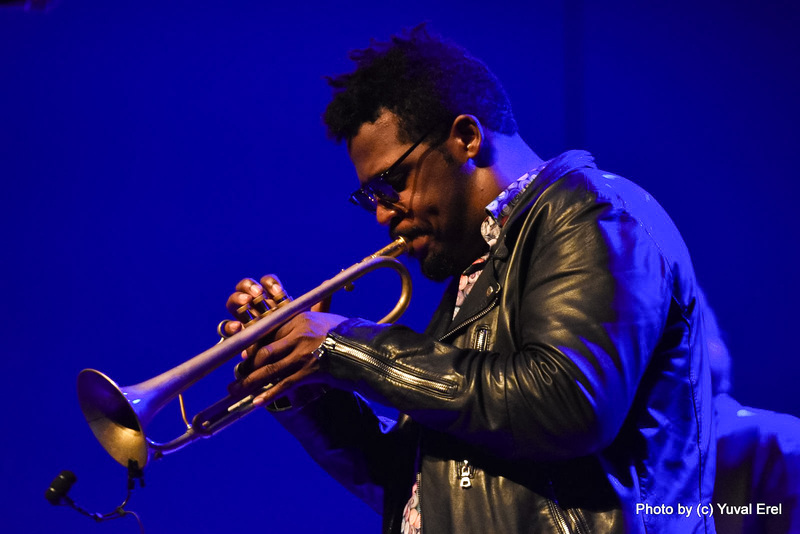 Keyon Harrold’s music is an immersive experience, one song flows into another, with myriad melodies, rhythms and harmonies, moods and messages, all flowing between the musicians onstage and the audience; music resonating in the body, heart, and mind. The Keyon Harrold Quintet – Keyon Harrold – trumpet, Nir Felder – guitar, Federico Peña – piano, Kyle Miles bass, Charles Haynes – drums – performed at the Tel Aviv Jazz Festival, in a concert that featured special guests, vocalist Andrea Pizziconi and saxophonist Eli Degibri. It was a transcendent experience, yet deeply rooted in the here and now, expressing emotional and political truths in word and sound. Harrold’s trumpet has a golden glow, warm, liquid notes floating out with a sound suffused in radiance. Yet it can also dance, growl, howl and hammer out forcefully. Because you’re gonna go through trials/you’re gonna go through tribulations/But you got to count it all joy; that your trials only come to make you strong.” Federico Peña opened this piece on the piano, with drums and guitar coming in later, with a very muted soft touch. Then the music grew louder as if it was getting power from the mother’s words, and Keyon Harrold came out with his trumpet, sending his song out into the world. The Mugician, the title of Harrold’s second solo album released in 2017, refers to his concept of musicians as makers of magic, as he explained: “cause we use it to raise your vibrations…make you feel better…so allow yourself to be healed, OK?” The music is mesmerizing, drawing the listener on into its spell, its sensory splendor. Seeing the music is just as captivating, watching and hearing the musicians, each doing his own thing, as melodies, harmonies, rhythms develop, sometimes together, sometimes conversing, sometimes taking entirely different directions, diverse moods, genres, and journeys within a single song; a sound representation of co-existence. Harrold’s stage presence reflects a confident ease, moving with the music, taking pleasure in the music and the moment. There’s a beauty in the music that perhaps reflects an underlying optimism, that belief in the healing power of music. Introducing a new song, Love in Tragedy, he said: “I guess maybe I’m a hopeless romantic. I always want things to work out sometimes they don’t sometimes they do.” A lovely melodic phrase on the piano told a story without words, and then when Pena shifted from the piano to the keyboard, something more rhythmic came into it. As the stage lights glowed magenta and orange, the trumpet came in, the intensity rose, and when the melodic phrase returned, it was deeper, informed by all that had happened before. Much of the music is directly political, as when Andrea Pizziconi joined Harrold onstage for Circus Show, a song that deals with the current situation in America: “got up this morning the news was insane,” and later for a riff on “tearing the walls down” that keep people apart. It was not all about politics, the concert was very much about music. Pizzicone sang Never Let Me Go (Jay Livingston and Ray Evans, first performed by Nat King Cole), with Keyon Harrold in a beautiful trumpet interlude, a song which they dedicated to the late Roy Hargrove (1969 – 2018). Saxophonist Eli Degibri joined Harrold onstage for some intense jamming, free and fun. Most moving was the performance of M.B. Lament, a song dedicated to Michael Brown, who was fatally shot by police in 2014 in Ferguson, Missouri, where Harrold grew up. Introducing the song, Harrold spoke movingly as the parent of a 12, almost 13-year-old son, concerned that people might view the tall boy as a threat, yet saying, “I’m hoping that we can change that narrative, that everybody will be treated free and equal.” On a somber note, there have been so many black youths and men killed by law enforcement that Harrold added to the song: When Will it Stop? M.B. Lament began with a melody of haunting beauty, delicate notes and small silences on the piano, the trumpet with an elegiac tone of piercing sorrow, with Kyle Miles on the contrabass rather than electric bass. Then the music opened up to something louder, freer, and full of power, become a lament and a statement. Moving into When Will it Stop? Harrold’s recorded voice speaks into the music: “If you’re going to say all lives matter, you can’t exclude black lives…we matter,” then concluding with We Shall Overcome on the trumpet, a song both mournful and strong.